The ice starts to thicken along the coastline of the Hudson Bay in Churchill, Manitoba as winter approaches and freezes up the area. 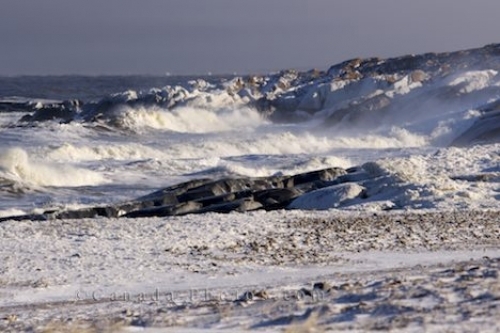 Rugged rocks covered in ice surround the coastline giving the waves a place to show off their display of power. Picture of the icy coastline of the Hudson Bay in Churchill, Manitoba as the waves break along the rugged rocks.